MCLEAN, Va. — Kajeet, the industry leader for safe, affordable K-12 mobile solutions, announces its expanded Kajeet SmartBus offerings, creating a completely Connected Bus for school districts. In addition to filtered school bus Wi-Fi and Global Positioning System (GPS), Kajeet SmartBus solutions now include: Push-to-Talk (PTT), Camera Offload, and Intelligent Sensors. PTT: Safe, easy-to-use handsets provide the path for instant communication between Dispatch and bus drivers. With one push-to-talk button, drivers stay focused on the road, but can remain in communication with their K-12 transportation departments. Camera Offload: Automatically download video camera data from DVRs on the bus to school district servers, saving time from physically collecting this information on school buses to easily view and address any incident that occurs on the school bus. Intelligent Sensors: Sensors and switches provide transportation administrators real-time notifications of events taking place on school buses in their fleet via a system of automated alerts (i.e. Silent Alarm). Today’s school buses are more than just vehicles to transport students. 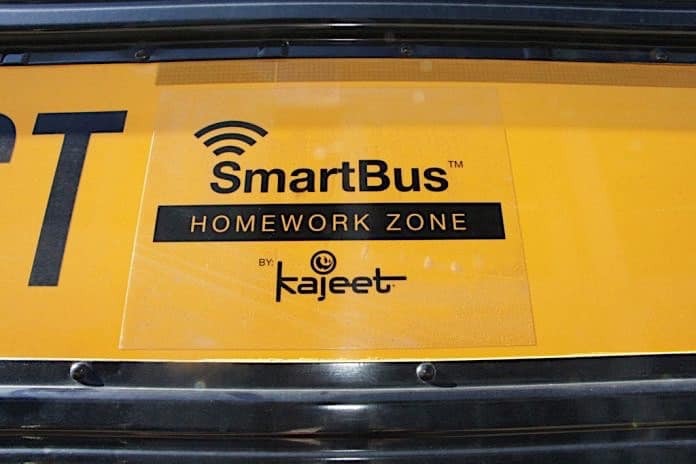 The existing Kajeet SmartBus solution turns buses into mobile classrooms where students can continue to learn, work on homework, and collaborate with peers by connecting to CIPA-compliant, educationally-filtered 4G LTE Internet on any of the six North American wireless carriers. The Kajeet Connected SmartBus™ takes that Wi-Fi for students and expands it to connect more technology to ensure a safe bus ride. The Kajeet SmartBus solution is used in over 150 school districts across the U.S. and Canada, providing access to six 4G LTE North American wireless carriers. To learn more about the Kajeet SmartBus, please visit www.kajeet.net/smartbus.